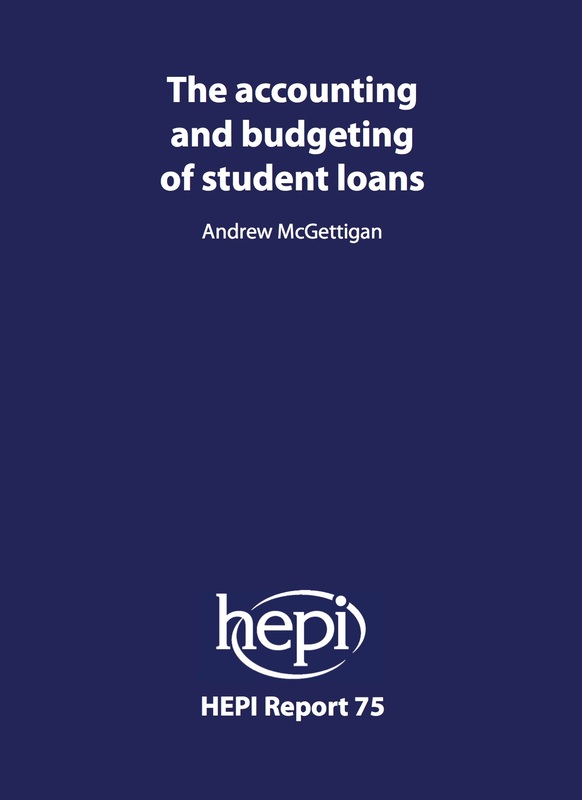 In a new HEPI pamphlet, The accounting and budgeting of student loans, Andrew McGettigan reveals how the treatment of student loans in the national and departmental accounts is driving policy. The Department for Business, Innovation and Skills (BIS) has been wrestling with the multi-billion pound impact of student loans. It was spared emergency cuts to the rest of its budget when new accounting conventions for loans were introduced in 2013/14. But these new conventions incentivise the department to control loan outlay and improve repayments in ways that neither universities nor graduates may welcome. ‘Questions about the sustainability of the current undergraduate fee-loan regime are not academic questions about what happens after 2045. Budgetary pressures arise today. ‘Uncertainty surrounds the estimations of future graduate repayments but their estimated value has deteriorated markedly in recent years. This decline generated a major challenge for the BIS budget, which has faced a cumulative shortfall of perhaps £10 billion over the last four years. Unplanned cuts of around £800 million for 2015/16 were only averted by changing retrospectively the accounting and budgeting conventions for student loans in 2013/14. ‘The Treasury has incentivised BIS to improve the value of repayments from an estimated equivalent of 55p per pound loaned to 65p. Achieving that target would be the equivalent of improving BIS’s finances by £1 billion for each year’s loan issue. ‘How can BIS do it? Most likely by restricting maximum tuition fees for the majority of courses at the majority of institutions and by toughening up repayment terms for borrowers. ‘Efforts to sell loans to the private sector are driven by concerns regarding their risk and their impact on public debt. Loans will only be “off-balance sheet” if they can be sold. ‘The accounting treatment of student loans may sound dry. But it is in fact driving policy in three crucial ways. ‘First, the big shift from funding universities via grants from Whitehall towards funding students via £9,000 loans occurred partly because loans do not score towards the deficit. This is also one reason why some people now want maintenance grants to be displaced by bigger maintenance loans. ‘Secondly, tougher repayment conditions are on the cards partly because the Department for Business, Innovation and Skills now has to recover any increase in loan default rates from their own budget. Without stricter repayment terms, there could be cuts to other key departmental programmes, such as apprenticeships or science. ‘Thirdly, because student loans appear in the main measure of the nation’s debt, selling off the loan book now looks good even if it leads to less government revenue in the future. Previous HEPI pamphlets argued that official figures underestimated the true cost of student loans – see, for example, John Thompson and Bahram Bekhradnia, The cost of the Government’s reforms of the financing of higher education – an update (December 2013). That is now widely accepted and this new report examines the budgetary consequences of lower estimated loan repayment. The Department for Business, Innovation and Skills is responsible for English higher education. The maximum undergraduate tuition fee has been £9,000 per year since autumn 2012. In BIS’s accounts for 2013/14, £9 billion of new loans were issued but repayments received only amounted to £1.5 billion – a net cash outlay of £7.5 billion. That same year, the value of its loan holdings – the loan book of all outstanding student loan accounts – only increased to £33.3 billion from £30.7 billion. That is an increase in value of only £2.6 billion, much lower than the £7.5 billion in cash that was issued. BIS had to use £3.4 billion of additional funding from the Treasury to cover the unanticipated drop in value. In the two previous years, BIS had used a total of £3.7 billion for the same purpose. By March 2014, BIS’s financial position was therefore £7.1 billion worse than planned as a result of student loans. In 2014/15, BIS will be responsible for over £10 billion of new loan issues rising to £12 billion in 2015/16. BIS’s planned budget allocation to cover projected non-repayment on new loans will be short by at least £1 billion for each of these years. Another £1.5 billion is likely to be needed each year to cover the continuing impact of low bank base rates on existing loans. For 2014/15, BIS has requested another £4 billion to cover these impacts. It is not yet known how much of that facility it has needed to use. Were it to utilise all of that additional resource, the last four financial years would have required £11 billion of additional, unplanned funding to deal with loans. Student loan accounting conventions were changed retrospectively in 2013/14 to cope with these ongoing challenges. There is now a mechanism in place to cope with excessive levels of projected non-repayment, but this translates into cuts to other parts of BIS’s planned spending if BIS is unable to find ways to improve graduate repayments. The Office for Budget Responsibility’s long-range projections for student loans estimate the impact on public sector net debt to peak at over £100 billion by 2035 (in 2014 terms). This is in addition to the impact of running deficits or otherwise for the next twenty years. Andrew McGettigan is the author of The Great University Gamble: money, markets & the future of higher education (Pluto, 2013). His writing has appeared in the Guardian, the Observer, Times Higher Education, Research Fortnight, London Review of Books and Radical Philosophy. He blogs on higher education financing at http://andrewmcgettigan.org. Dr McGettigan has done a superb job in demystifying the accounting and budgeting framework used to describe student loans. Student loans continue to be a live issue because , however expressed, the savings to the public purse that were anticipated from the replacement of funding with student loans now seem very unlikely, in part because fees are higher than anticipated, and in part because future former students earnings are now expected to be lower than had been estimated. There is no easy solution. If government is not prepared to foot the bill for this under-estimation of costs, then someone else will have to pay. Selling the loan book is an extremely expensive way of postponing the problem. Cutting BIS’s expenditure, on top of the cuts already anticipated, would be painful. So how about ‘tweaking’ the terms and conditions of loan repayments? It has been suggested that such changes might be done retrospectively, to students who have already taken out loans. If this were done, the miss-selling would certainly be a ‘moral’ issue, particularly as many the victims would be aged 17 or younger when they were making their decision to go to university and take on the resulting debt. But it is not just a moral issue, there would be costs, and not just for the individuals directly affected. When terms are broken as a borrower, lender, insurer, etc, there is an undermining of trust which has far reaching consequences. In many countries the population has no trust in the commitments made by their governments and this means that many possible economic levers are broken. And the cynicism generated probably undermines any sense of civic duty. With the student loan conditions it is even worse because the miss-selling (if that is what it turns out to be) of student loans was backed not just by government, but by the higher education sector, and many others in the business of advising potential students. One of these advisers, ‘Money Saving Expert’ Martin Lewis has written, ‘while it [the Government] would expect radical students to protest, I want it to know that my voice too will be shouting very loudly’. It is to be hoped that should this ’easy’ option be chosen he will be joined by shouts from Vice Chancellors, school teachers and all those who have ‘explained’ higher education loans using the government’s prospectus.